Kerry Washington stars as Olivia Pope on Scandal. Planned Parenthood and the conservative Media Research Council have both released statements about what happened on last night's episode of ABC's Scandal. In the episode, Republican Sen. Mellie Grant (Bellamy Young) filibustered a bill to defund Planned Parenthood (and it worked), while Olivia Pope (Kerry Washington) decided to abort her baby. Viewers saw the abortion while "Silent Night" played the background. Planned Parenthood released the following statement: "Tonight, the millions of people who tune into Scandal every Thursday night learned that our rights to reproductive health care are under attack. Never one to shy away from critical issues, [showrunner] Shonda Rhimes used her platform to tell the world that if Planned Parenthood lost funding for contraception counseling, STI testing, cancer screenings, and safe, legal abortion — millions of people would suffer. And this episode wasn’t the first time one of Rhimes’ characters had an abortion, yet tonight we saw one of our favorite characters make the deeply personal decision that one in three women have made in their lifetime. We applaud Shonda Rhimes tonight — and every Thursday night – for proving that when women are telling our stories, the world will pause and watch. We just hope those in Congress — and throughout the nation — who are steadfast on rolling the clock back on reproductive health care access are taking note. The MRC had this to say: "Hollywood’s liberal values permeate movies and television. 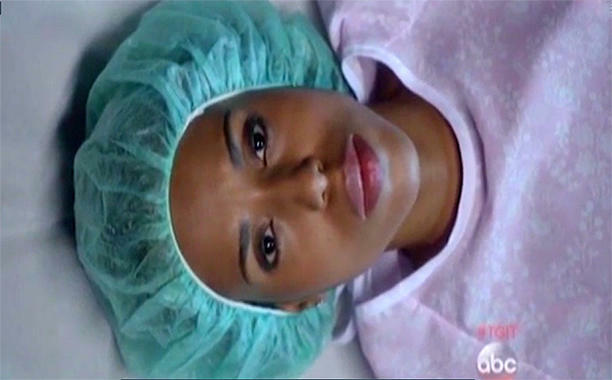 Last night’s episode of ABC’s Scandal was pretty much an hour-long advertisement for Planned Parenthood. In the most disturbing scene, the main character has an abortion to 'Silent Night' (a hymn celebrating the birth of Jesus) playing in the background. This is Hollywood’s moral depravity on full display." Shonda Rhimes revealed an additional bit of information on Twitter: "The #Scandal writers did their research– every budget item Mellie recites it actually REAL. #TGIT"
Kerry Washington summed up her feelings by tweeting two hashtags: "#IStandWithMellie #IStandWithPlannedParenthood"